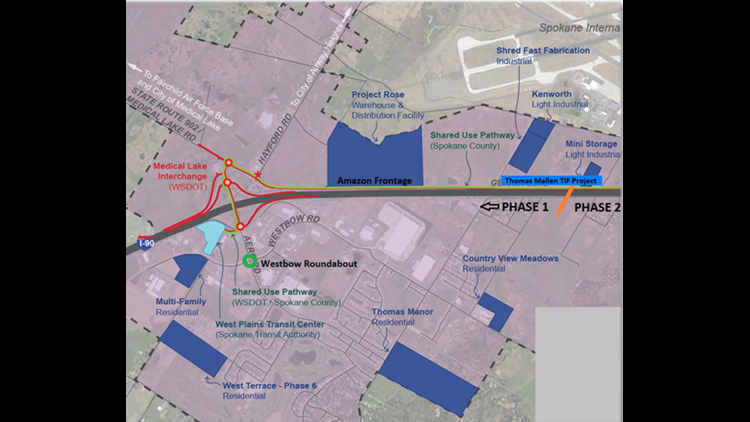 The road improvements are meant to address the economic growth in the area, namely the thousands expected to move to the region after the Amazon fulfillment facility is built. 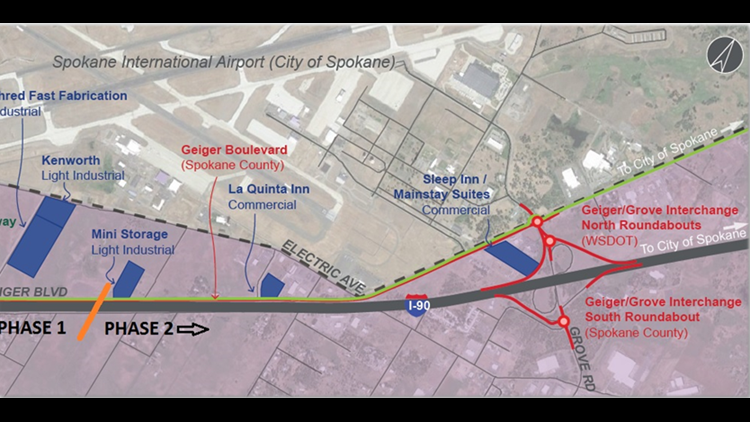 SPOKANE, Wash. — The Spokane County planners are set begin a major road project to improve the Geiger Boulevard area west of Spokane. County planners will soon ask for bids on the Geiger Boulevard Infrastructure Improvements Project. The project includes constructing roundabouts, widening the road for center turn lanes, extending shoulders, installing water and sewer, and adding lights. 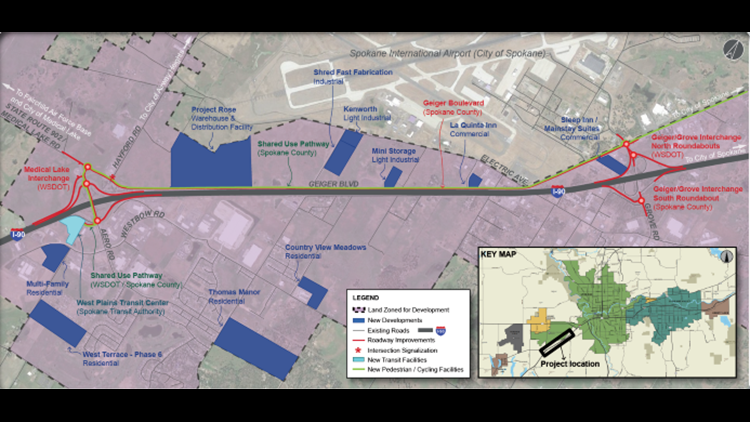 The road improvements are meant to address the economic growth in the area, namely the thousands expected to move to the region after the Amazon fulfillment facility is built. An Amazon spokesperson said they expect to create more than 1,500 jobs. The county is looking to build potentially seven new roundabouts near the Medical Lake Exit and Geiger-Grove interchanges. County Engineer Chad Coles said roundabouts keep traffic moving when there are a lot of cars on the road. The first phase of the project includes a traffic light at the Hayford Road and Geiger Boulevard intersection and a bus stop at Hayford Road. The second phase would focus on improving the infrastructure on Geiger. It includes adding lighting at the intersections and a bus stop on Electric Avenue. “This will make that whole area ready for development,” Coles said. A group of dentists plan to build new dental officers where one of the roundabouts will be, at the intersection of Aero and Westbow Roads. We caught up with Dr. Corey Plaster between patients at 5th Avenue Dental. He is part of a network of providers that work at different locations in Spokane County. "We just saw that location there between Cheney and Medical Lake and Airway Heights being a location where people could easily get there from those communities,” Plaster said. The new building will house a West Plains Dental and KidSmile Dental. Plaster said they want it to be accessible to better serve the patients they have and any new faces they see. "We're just looking forward to being out there and being part of the excitement, bringing services out there and seeing what happens,” Plaster said. The project is estimated to cost $44 million. It will be done in two phases over a two-year period.